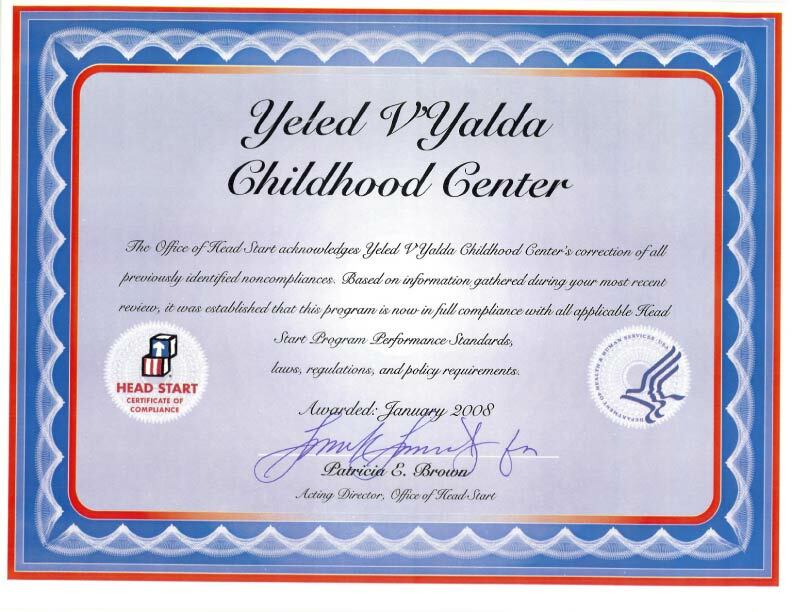 Because of the Head Start Program’s requirement that 10% of children served must have identified special needs, Yeled V’Yalda quickly encountered the challenges of funding the necessary therapies. In addition, the agency had difficulty coordinating the Head Start schedule with the visits of outside therapists who came to provide these services and integrating these services with the individualization provided by teachers. Consequently, YVY initiated its program of special services to address the needs of children who require assessment and treatment for cognitive and developmental disabilities. YVY’s highly skilled state licensed staff provide these services through the Board of Education ("BOE") and the Committee of Pre-School Special Education ("CPSE") and through collaboration with other professional community-based organizations. One of YVY’s great strengths is that it is an approved evaluation site, as well as a related services and Special Education Itinerant Teacher ("SEIT") provider for the New York City Board of Education and Early Intervention. This program has two components: monolingual and bilingual evaluation services for children aged 3 to 6, and related services for children 6 to 21. Children 3 to 6 who are suspected of developmental delays are referred to YVY through the NYC Board of Education Committee of Pre-School Special Education. The recommendations of the evaluators are incorporated into an Individualized Education Plan ("IEP") or an Individual Family Service Plan ("IFSP") with the parents' input, to address the developmental needs of the child. Teachers work with the service professionals to support the goals of the IFSP/IEP in their curriculum and parents are also encouraged to work with these goals at home. The YVY program offers a wide range of therapies, among them: SEIT, Speech and Language Pathology, Audiology, Occupational Therapy, Physical Therapy, Counseling, Social Work and Health Paraprofessional Services. Services take place at the Head Start center, in the classroom or out (as appropriate) or, occasionally, at the child’s home. YVY's Head Start staff work closely with the service providers to incorporate the goals of the individual education plan and the family plan into the curriculum. For those children 6 to 21, referred to YVY through the BOE/CPSE , the board conducts the evaluation and then refers the children to YVY for the necessary services. Almost 1,000 children ages 3 to 21 are currently provided with speech, occupational and physical therapies, SEIT teachers and counseling services. Disabilities services are also being delivered in the Pre-school Head Start program. With more than 200 students currently being served, this division serves children from 3 to 5 years old as a contract agency for the New York City Department of Education. If parents suspect that their child may have developmental delays, they can have the child professionally assessed to assure that any deficit is detected and taken care of before the child enters elementary school. YVY’s disabilities service reflects the actual needs of the children in the agency’s catchment areas and in fact YVY has recently initiated its own Special Education and Early Intervention programs to meet the existing ongoing need in the 0 to 3 population.